Discs of Sweelinck’s keyboard music are still surprisingly uncommon. Robert Woolley has made a fine if unhurried start on working through it on organ and harpsichord for Chandos (10/03 and 6/09), and there are a few other recordings here and there, but hardly enough to make this recital from French harpsichordist Sébastien Wonner seem surplus to requirement. Playing on a copy of a 1612 Ruckers harpsichord hybridised by the addition of a four-foot register, Wonner selects works from the contrapuntally spun repertoire normally associated with the organ – settings of psalm-tones, hymns and other polyphonic pieces – to put alongside the flamboyantly intricate variation sets, toccatas and fantasias more obviously intended for the harpsichord. The result is pleasingly varied and pleasingly international too, wafting in through our Amsterdam window strains of Germany, Spain, Italy and above all England, whose master composers of the virginalists’ school (John Bull and Peter Philips especially) leave the strongest stylistic imprint. That’s not to say that Sweelinck does not have a powerful identity of his own. Far from it. Here is a master of expressive counterpoint and harmony; listen to the tensile power of the contrary-motion opening of Toccata primi toni or the way inner parts direct the ebb and flow of the variations in the beautiful Mein Junges Leben hat ein Endt and Ick voer al over Rhijn, thus allowing them to be so much more than exercises in virtuoso pattern-spinning. Wonner’s playing is on the whole flexible, intelligent and sensitive to the music’s lyrical and contrapuntal contouring. 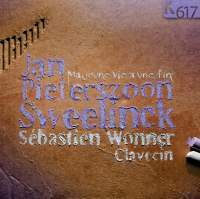 He could have done more to characterise individual variations in Mein Junges Leben but establishes a rolling momentum in Pavana hispanica, and in general succeeds in conjuring the distinctive musical personality of Sweelinck – serious, complex and eloquent, even when the semiquavers are flying. The harpsichord is characterful and wonderfully clear-textured, though perhaps a little unyielding in full registration. The four-foot register gets a little outing on its own in Malle Sijmen, delightfully.